Microsoft announced Gears of War 5 at its E3 Media Briefing today with a story trailer and is slated to arrive next year on Xbox One. But that’s not all: Microsoft-owned studio The Coalition is also working on two Gears of War spin-offs, Gears Pop, a mobile game, and Gears Tactics, a strategy game for PC. First let’s start with Gears of War 5. 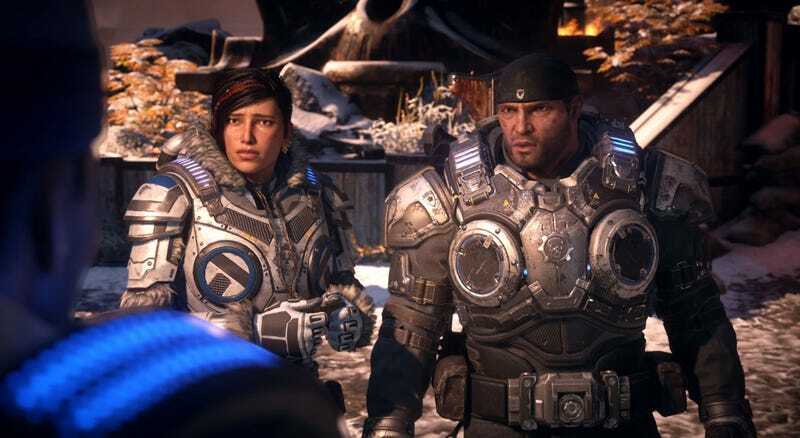 The trailer begins by showing Gears of War 4's Kait Diaz telling Marcus Fenix about the nightmares she’s been having before showing the two of them set off to find out what these premonitions mean. We still see some squad-based exploration and combat, but overall the game looks a lot more cinematic and ruthless than past games, which is saying something given the series is about humanity being almost snuffed out by one hostile race of monsters after another. 2016's Gears of War 4 shifted the narrative tone of the series away somewhat from the deep bro-love of the original trilogy and delivered an even better Horde mode than its predecessor, but it didn’t dramatically reinvent the wheel. It based on the story trailer alone it remains to be seen whether Gears of War 5 will be just another refinement of the hulking, cover-based, third-person shooting that popularized the series or something more. As for Gears Pop and Gears Tactics, we know even less, other than that they’ll each be taking the COG and Locust characters to new genres and platforms for the first time. Gears of War 5 was one of the games listed in a Walmart Canada leak back in May, alongside other games like Hitman 2, Just Cause 4, Rage 2, and Assassin’s Creed Odyssey which have since also turned out to be real.